In all of my searching for my brother, I know he really never left me. Over a decade after Harriette Mandeville lost her brother to a drunk driver, she saw him in her kitchen. This unusual experience opened a window for exploration in Mandeville, and a desire to search for answers to questions that had been simmering for years. 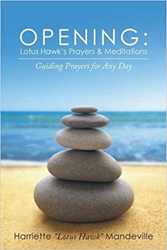 In “OPENING: Lotus Hawk’s Prayers & Meditations,” Mandeville, who goes by her spirit name, “Lotus Hawk,” offers an inspirational guide to prayer and meditation. In this workbook, filled with affirmations and meditations for various intentions, Mandeville offers a tool for connection and creativity and a path to finding answers to life’s questions. Mandeville said that, because of tapping into her spiritual self and constantly tuning in to the universe and God’s messages, she was able to receive well-being that she hopes to give to others. Harriette Mandeville, who goes by the spirit name “Lotus Hawk,” has worked as a teacher and actress, playing many roles in television, film and off-Broadway productions, including the 2009 movie “The Rebound,” with Catherine Zeta-Jones. She now works as an intuitive coach and facilitator for Lotus Hawk’s Empowerment Theatre. She resides in East Elmhurst, New York. For more on Mandeville or her book, visit http://www.lotushawkspeaks.com/.